Norwegian Cruise Line (NCL), also known in short as Norwegian, is a cruise line founded in 1966 and based in the United States. It is the third-largest cruise line in the world, controlling approximately 8.7% of the total worldwide share of the cruise market by passengers as of 2018. It is wholly owned by parent company Norwegian Cruise Line Holdings. The cruise line was founded as Norwegian Caribbean Line in 1966 by Knut Kloster and Ted Arison, with the 8,666-ton, 140m cruise ship/car ferry, Sunward, which in 1966 operated as a car-ferry between Southampton UK and Gibraltar, for that one, short season only. Arison soon left to form Carnival Cruise Lines, while Kloster acquired additional ships for Caribbean service. Norwegian pioneered many firsts in the cruise industry like: the first Out Island Cruise, the first combined air-sea program (marketed as "Cloud 9 Cruises") which combined low cost air fares with the cruise, first shipline to develop new ports in the Caribbean, like Ocho Rios in Jamaica. Like the original Sunward of 1966, Norwegians's second ship, the Starward had the capability to carry automobiles through a well concealed stern door. Later, this area was turned into cabins and a two deck movie theater, which is now a casino. Norwegian was responsible for many of the cruise innovations that have now become standard throughout the industry. Norwegian made headlines with the acquisition of the France in 1979, rebuilding the liner as a cruise ship and renaming her Norway. The conversion cost more than US$100 million. The Norway was at the time significantly larger than any existing cruise ship, and exploited the extra space available by adding a greater than usual variety of onboard entertainment. Her success paved the way for a new era of giant cruise ships. A boiler explosion in May 2003 forced Norwegian to withdraw the Norway from service, later being laid up in Bremerhaven, Germany until 2005 when she was towed to Port Klang Malaysia with the claimed intent to use her as an anchored casino or slow overnight casino cruises on her remaining boilers. Instead, she was sold for scrap and renamed the SS Blue Lady and later beached at Alang, Gujarat, India in August 2006 with claims that she had not been cleaned of toxic materials. On September 11, 2007, the India Supreme Court issued an order permitting her to be broken-up at Alang, despite the presence of large amounts of hazardous asbestos remaining on board. Norwegian has expanded to other parts of the world, including Alaska, Europe, Bermuda, and Hawaii. Between 1997 and 2001 the company also operated cruises out of Australia under the name Norwegian Capricorn Line. Norwegian acquired Orient Lines in 1998. After talks, Norwegian itself was acquired in 2000 by Star Cruises, a subsidiary of Genting Hong Kong, part of the Malaysia-based Genting Group. In 2007, Star Cruises sold Orient Line's Marco Polo to Transocean Tours, and Orient Lines ceased operations in early 2008. In 2002, Norwegian purchased the half-complete hull of the first Project America ship, at the time under construction at Ingalls Shipbuilding in Pascagoula, Mississippi, US, which was towed to Germany to be completed at the Lloyd Werft shipyard. Subsequently, Norwegian acquired the rights to move two ships built entirely outside the United States under the US flag, making it possible to start a US-flagged operation under the brand name NCL America. In 2003 the company announced the purchase of the American-flagged liners SS United States and SS Independence. In their July 2007 fiscal report, Norwegian noted the sale of the Independence, renamed SS Oceanic some time before. On July 1, 2010, the SS United States Conservancy struck a deal to buy the SS United States for $3 million. On February 1, 2011, the ownership was officially transferred to the SS United States Conservancy. In August 2007, Star Cruises sold 50% of Norwegian for $1 billion to US-based Apollo Management in order to strengthen Norwegian's financial position. Subsequently, Norwegian reported in February 2008 that the Pride of Aloha, one of the two remaining NCL America ships, would be withdrawn from service in May of the same year. Initial reports suggested she would be transferred to the fleet of Star Cruises, but it was later announced that she would return to the Norwegian international fleet as the Norwegian Sky, while the Norwegian Majesty and Norwegian Dream would be sold to Louis Cruise Lines. The sale of the Norwegian Dream was subsequently canceled. It was announced in September 2012 that the Norwegian Dream would become the Superstar Gemini for Star Cruises, from January 2013. On June 1, 2012, Norwegian announced the signing of a memorandum of agreement to exercise its option to purchase Norwegian Sky. The purchase price was approximately $260 million, financing being provided by the seller. On October 17, 2012, Meyer Werft and Norwegian reached a second agreement for the construction of two new vessels. Slated for delivery in October 2015 and 2017, respectively. The project was under the code name "Breakaway Plus Class", with the vessels expected to be 163,000 gross tons and hold 4,200 passengers. 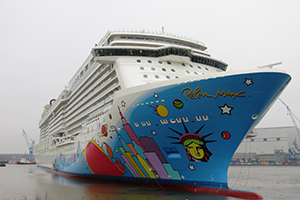 The Norwegian Escape entered service in November 2015 and weighs 164,600 tons. Norwegian is expected to confirm its option for the 2017 vessel soon. Two more vessels were ordered on July 14, 2014, they will enter service in 2018 and 2019 and will be slightly bigger at 164,000 GT. Following an initial public offering and corporate reorganization in 2013, Norwegian was made a wholly owned subsidiary of Norwegian Cruise Line Holdings (NCLH), while Norwegian's previous owners Genting Hong Kong, Apollo Management and TPG Capital exchanged their stakes in Norwegian for shares in the newly listed NCLH. On 11 March 2014, Norwegian announced that it was canceling all future port calls in Tunisia following an incident where the country forbade Israeli nationals from disembarking. In December 2016, it was announced that Norwegian Cruise Line has reached an agreement with the Cuban government. In May 2017, the Norwegian Sky was the first Norwegian vessel to ever visit Cuba. The Norwegian Sky makes weekly trips from Miami to Havana, Cuba, making Norwegian the only line sailing that route weekly. On May 2, 2017, Norwegian Cruise Line announced a new PortMiami Terminal. The construction began on May 1, 2018, and is scheduled for completion by fall 2019. Between 2022 and 2025 Fincantieri will deliver four ships and in July 2018, the company announced an order for two more ships of Leonardo Class. They are expected to enter service in 2026 and 2027. In December 2018, Norwegian revealed plans to build a new pier in Alaska's Icy Strait Point. All its ships are flagged to The Bahamas, except for the sole exception of Pride of America, which operates cruises within the United States and is flagged and registered in the US, as well as being owned by a US-registered subsidiary, NCL America. Norwegian Encore. Class: Breakaway Plus Class. Inaugural voyage: 2019. Gross tonnage: 169,145. Unnamed. Class: Project Leonardo. Inaugural voyage: 2022. Gross tonnage: 140,000. Unnamed. Class: Project Leonardo. Inaugural voyage: 2023. Gross tonnage: 140,000. Unnamed. Class: Project Leonardo. Inaugural voyage: 2024. Gross tonnage: 140,000. Unnamed. Class: Project Leonardo. Inaugural voyage: 2025. Gross tonnage: 140,000. Unnamed. Class: Project Leonardo. Inaugural voyage: 2026. Gross tonnage: 140,000. Unnamed. Class: Project Leonardo. Inaugural voyage: 2027. Gross tonnage: 140,000. Norwegian owns two private islands in the Caribbean: Harvest Caye in Belize and Great Stirrup Cay in the Bahamas.